It is eight months since Kapiti Coast artist, Lawrence Leitch returned to the shores of Lake Wakatipu, sketchbook in hand. 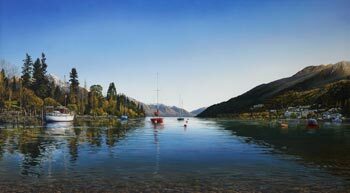 In a land renown for, and blessed by its scenic beauty, Lake Wakatipu is one of the greatest gems of the South Island. In the southwest corner of the Otago region, with a length of 80 kilometres, Wakatipu is New Zealand's longest lake. In satellite images it is revealed in the shape of a dramatic thunderbolt surrounded by mountains. Five rivers flow into the lake giving its crystal clear waters a 99.9 percent pure rating. For all who visit, Wakatipu is breathtaking in its beauty and for an artist of Leitch's calibre it is a masterpiece waiting to be re-captured. However, the creation of a masterpiece is no easy matter. Returning to his studio Leitch commences work from detailed pencil drawings covered with notations and references to colouration and light and shade. This is the foundation upon which his masterpiece is built. Long before Leitch's unique application of colour and glazes, every millimetre of the work is sketched, visually revisited and visualised. Month-after-month, week-after-week, day-after-day, hour-after-hour the artist engages in an almost meditative focus upon the work at hand. This is not an exercise for the faint-hearted. Leitch is one of the few artists alive today possessed of the discipline, commitment and over-whelming talent required to create this Southern Hemisphere masterpiece. Eight long months after its inception International Art Centre are privileged and delighted to announce that the work is now on view in the gallery.